India’s capital came to a standstill when a heavy storm swept over Delhi, dropping what was a rare sight for many residents – hail. While many delighted in the covering of white and posted photos and videos on social media, for others the sudden downpour caused significant travel disruption. 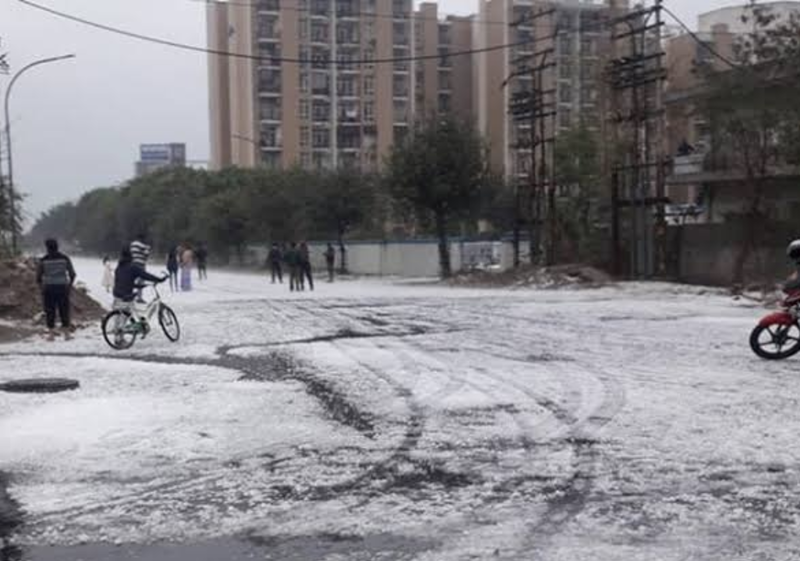 Delhi and adjoining areas had not seen a heavy hailstorm like Thursday’s in “at least a decade” said Mahesh Palawat, director of the private weather agency Skymet. AccuWeather described the occurrence of hailstorms in Delhi as “infrequent”. Residents compared the scene to famous Himalayan hill towns like Shimla and Srinagar, while the accompanying lashing wind brought comparisons to Chicago. While even relatively light rains can bring Delhi’s roads to gridlock, the addition of hail and prolonged heavy downpour meant disruption extended to both flights and rail connections. At least 12 Delhi-bound trains were delayed by up to six hours, and dozens of flights destined for the capital were redirected to nearby cities during the worst of the storm, between 6pm and 8pm. Departure boards at the main Indira Gandhi International Airport showed many outbound flights suffered significant delays. The airport apologised to customers, saying the “severe weather… disrupted safe operations”. Nikita Mandhani, 30, didn’t get to see the spectacle of the hail herself – but she was certainly impacted by it. She told The Independent she spent more than six hours waiting at the airport for her flight to Bhopal, which had been scheduled for departure at 8pm. She missed a family wedding party, or sangeet, because of the disruption. The bad weather was not limited to Delhi itself – mountainous regions further to the north experienced heavy snowfall and authorities issued avalanche warnings for 16 of the 22 districts of Jammu and Kashmir, the Press Trust of India reported. But for residents of the capital, the storm at least brought relief from its notoriously bad air pollution. One AQI (air quality index) monitoring site put Delhi’s air quality at 144 “poor” at 7pm on Thursday – down from a high this week of 575 “hazardous” on Tuesday morning.